*99% Accurate at detecting typical pregnancy hormone levels. Note that hormone levels vary. See insert. 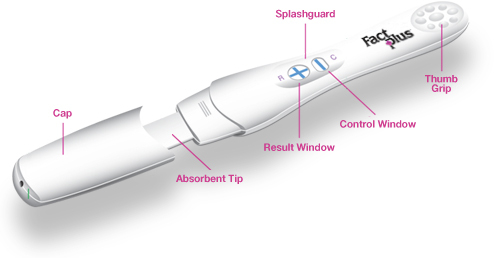 **Testing Early: Fact Plus can be used as early as 4 days before you expect your period. That's 5 days sooner than waiting to miss your period to test. The amount of pregnancy hormone increases rapidly in early pregnancy. In clinical testing Fact Plus detected the pregnancy hormone in 53% of women when testing 4 days before their expected period,74% at 3 days before their expected period, 84% at 2 days before their expected period and 87% at one day before their expected period.